His family was Irish and he's a Butler. Already looked into it. 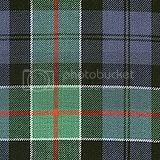 Apparently Irish clans go by district and not family name but when I looked up either or, its the same exact tartan. I think my brother's twin beds had a spread that looked like that pattern! That was MANY years ago! And *guest*, it's the Irish Butler tartan, whether or not Gerry claims it. He may not, but I thought it was interesting to find. Daughter of the Donald checking in. Macdonald clan, born and bred. You mean we MAY BE related??? How efin cool is that? Yes ma'am we could be! 1113th cousins twice removed! Thanks ladies! Keep 'em coming! Ummm don't you mean 1228th cousins?? ETS~ I said Cousin! 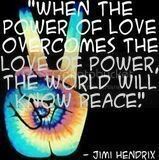 ....what would Uncle say? Those cookies look like Scottish shortbread or Lorna Doones. I love those! CLAN OOTLAND Master of Arms ( Puffer) reporting in. I have a Lot of Scots blood running through my veins, BUT all is LOWLAND ( who did not wear Kilts ( until Victorian Times) & did not have the "Clan System per se. 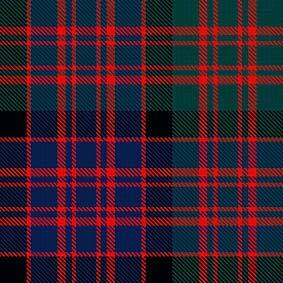 But I do have a "Family Tartan" = BLACK DOUGLAS ( my direct Rel. SIR JAMES DOUGLAS ( one of the "Bruce's LT.s with Wallace) & we are NOT a Part of the "current Douglass') My rel. came to the "Colonies in 1622, 1 step ahead of the "Watch"
Photo too large. Changed to a link. Puffer, my husband is from the Bruces and his Aunt a Wallace by marriage. *whispers* You may wanna shrink your pic though. its a bit too big, sweetie. SIS, another "suggestion" = "fashion" Tartans There are some GREAT ones out there & you could Pick your colors. Very cool! Thank you so much. 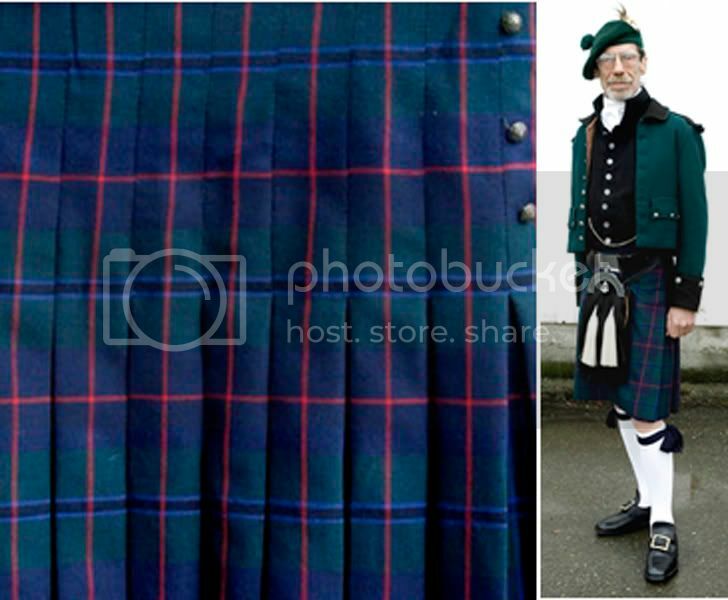 I received a "request" to see the Auld Lang Syne kilt being worn. 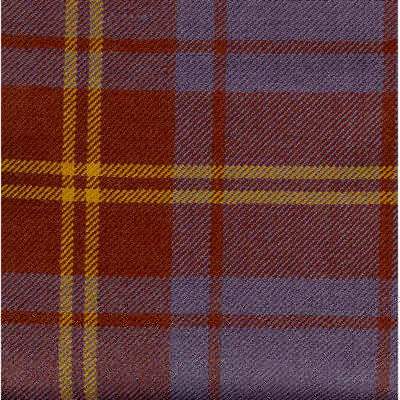 I just fell in love with that 2nd Auld Lang Syne tartan - with the teals and purples (my colors, of course). I have to find out how to buy some of that fabric, or get something made in it. Hi what if you dont have a clan. I am english and I dont know what else. My maidend name is Powell. No tartan, no clan? You can still wear several of them. There are some now for certain states, USA etc. I am at work but have a book at home with tartan pics. I will try and scan some. My last name is my own, by my mother's choice. So in a a way, my clan is a clan of one which began (and will end) with me. I gleefully, inspired by Gerry's 40th, was inspired to go to the local kilt warehouse and finally purchase the official state tartan for California which is based on the tartan of Naturalist John Muir! 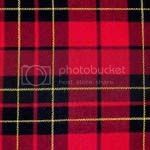 www.sportkilt.com has universal tartans and nontraditional kilts. I showed my kilt off during Christmas time to coworkers and family--Grandma asked when did I go to Scotland. Coworkers commented on expecting traditionalstyle dress like in the I love Lucy's -I'll take the highroad- skit. I understand Gerry doesn't have an official kilt since his family is of Irish descent. I checked for a few weeks and I came up with this tartan for the "Calhoun" family. It is Irish though and I married into this family - so does this count! If these cookies are going to be anything like last year's - everyone is going to be pleasantly surprised & completely dumbfounded!!! How did she do that??? My question is this what if you do not have a clan. Could some one adopt me. Could you please help. Thank you. Gemstone. Landa, I can't wait to see what you come up with (and I know you put so much work into doing these every year.....Thank you so much for your generosity). Me too!!!!! I want cookies with that, Landa!!! GALS/PALS Name: Thankyou PaisleyScot for my wonderful signature! I love it! 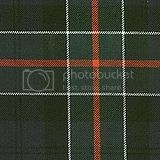 http://www.doyle.com.au/tartans/sligo_x.jpg O'Hart (Ua hAirt) family, County Sligo tartan. LMAO! I already have cookie cutters for that. Thank you, ladies. I had no idea that people had been posting in here again.